The plant Madia gracilis is best known for living in regions of higher altitudes, but can range from any altitude between 0 – 2590 meters (Calflora 2014). Within these altitudes the Madia gracilis has been known to grow in regions of the western United States such as Colorado, Washington, California and Oregon (Krimmel and Pearse 2013), as well as regions of the Andes Mountains (Celedón-Neghme et al. 2006). 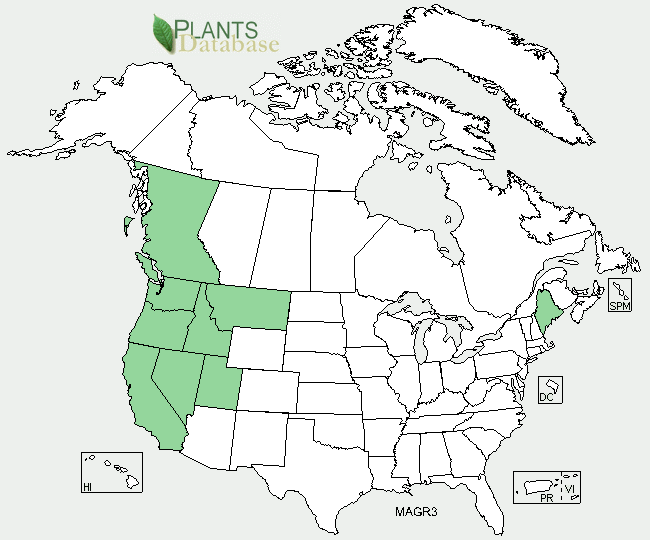 These regions are located in areas with similar geographical locations and elevations in relation to the equator and typically produce an alpine climate with some Mediterranean influences, perfect for organisms like the Pacific Yew, the Douglas Fir, the Giant Redwood, and the Madia gracilis to grow (Celedón-Neghme et al. 2006, Krimmel and Pearse 2013). Other specific characteristics of these regions is that they are very dry, accounting for minute amounts of rainfall annually. Less rainfall typically leads to less of an abundance of large, shade blocking trees, allowing for smaller plants like the M. gracilis to be exposed to full sunlight. The lack of rainfall also contributes to the presence of a very sandy, dry soil conditions, which the M. gracilis can grow perfectly well in (Krimmel and Pearse 2013). Also, because the landscape is so dry, there is less vegetative competition in the habitat to steal nutrients from it. The ability to live in these conditions most likely arose from an evolutionary mutation millions of years ago that allowed it to gain enough nutrients from the nutrient poor habitat to sustain life, creating its own ecological niche away from other plants that cannot gain enough nutrients from that soil type. The adaptation that has most likely allowed for the absorption of nutrients to occur in these environments is that presence of small, shallow root systems (Antos and Halpern 1997). Because the depth of the root stem is not very large in ratio to the plant, it is able to maximize lateral spread within the roots, being able to harvest as many nutrients as possible (Antos and Halpern 1997). Because Madia gracilis can survive in such dry soil conditions, it is used as a very helpful plant in ecological restoration projects. It has a very strong ability to quickly reclaim very disturbed land. It is also found inhabiting roadsides or other sand, silt or clay environments (Ross 2012). Along with roadsides and other similar environments, M. gracilis is a species typically known to dominate shrub and herb layers of forests. These layers account for all plant species approaching .01-5.0 meters in height (Evans et al. 2004).